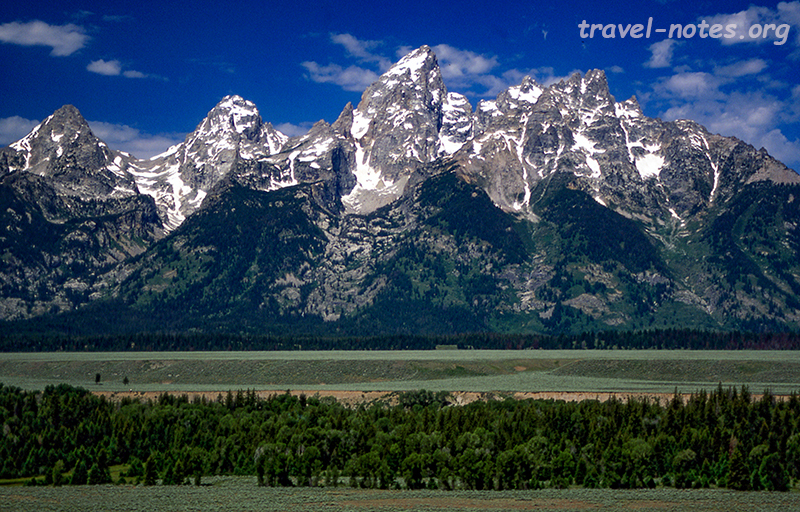 We got our first views of the Tetons while driving from Yellowstone after a tiring four day camping trip. After the cold and wet campgrounds we were looking forward to warm beds awaiting our arrival at the Hatchet Resort (13 miles from the park's eastern entrance). Although the resort (which should be renamed as "hostel") gave us what we were expecting for the cheapest price in the region, it was still way overpriced by any sane standards. 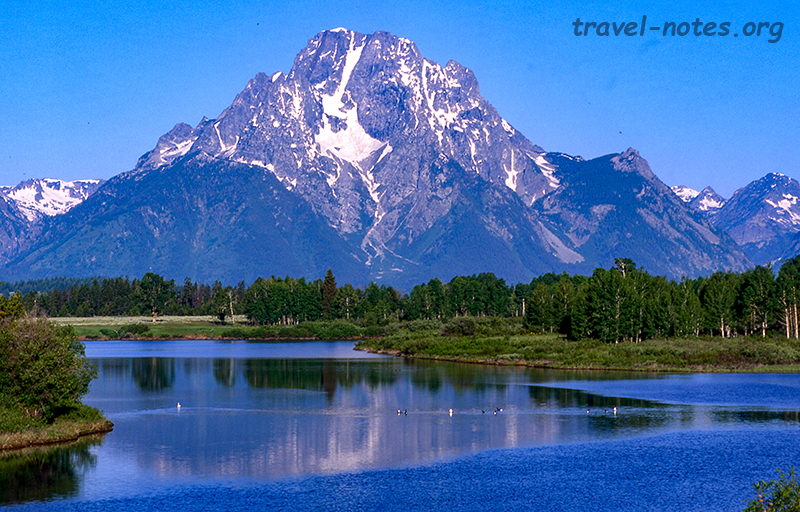 Grand Teton National Park is a part built around its primary attraction - the Tetons. All viewpoints look at the range from different angle and since all points "look" westward, the park needs to be covered in the forenoon. Well... all of this is true iff you restrict yourself to the park roads. Scenery and the surroundings change dramatically as soon as you hit any of the back-country trails. Since we did not have the equipment or the preparation for a long back-country adventure, we settled for a long day trip instead. We chose to walk the most popular trail - Lake Solitude (18.5 mi return). We cut the journey down by 4 miles since we took the ferry across the Jenny Lake. The trail to the lake will always be pretty crowded to start with as the trailhead is served by a boat and the trail goes past a falls and an Inspiration Point within the first half hour. 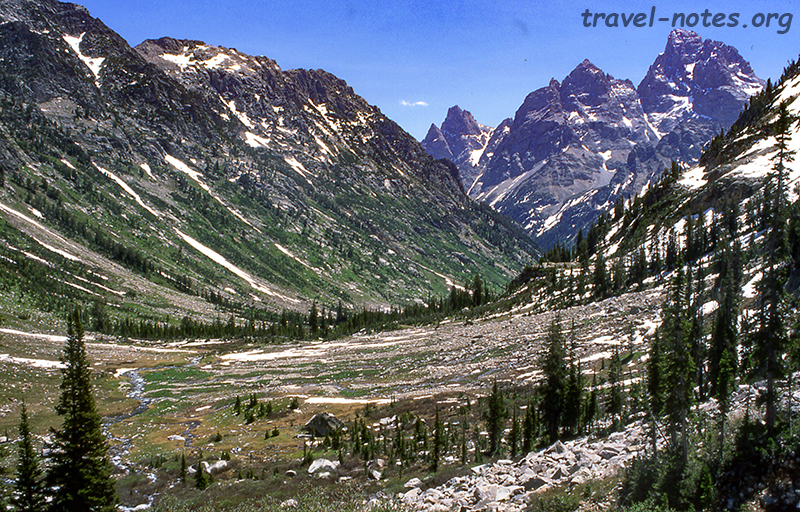 But the trail sheds about 90% of its visitors at the Inspiration Point giving you hope that the lake might be what its name suggests - "solitude". Praveen and Ranjit had joined us by this time and all 4 of us successfully completed the hike. Although the only serious uphill did not greet us till the last 3 miles, the hike still managed to sap our energy due to its sheer length. But we got more than what we asked for in form of stunning views of the valleys, waterfalls, wildlife (we spotted some moose and some bears) culminating in a frozen lake surrounded by glaciers. We spent the following day recovering from the hike, covering the drive-by points, horse back riding and on a quick but obscenely expensive trip to the top of the nearby ski summit via the longest tramway in the US. Despite having done so much, we still had an extra day before our return flights. Needless to say, the opinion was divided as how to best utilise it leading to the final parting of the groups. Me and my wife decided to fill up the time by more driving while the other two decided to hang around the park. After final good-byes, we (me and my wife) drove down the Centennial Scenic Byway to Salt Lake City via I-80 stopping by the Fossil Butte National Monument and the Flaming Gorge National Recreation Area on the way. The scenic byway (especially the section between Dubois and the park) and US 44 (in the Flaming Gorge region) were the only ones worth recommending. Thus, four and ten days after we left our mundane lives, we found us back in it counting the days left for our next "adventure"! 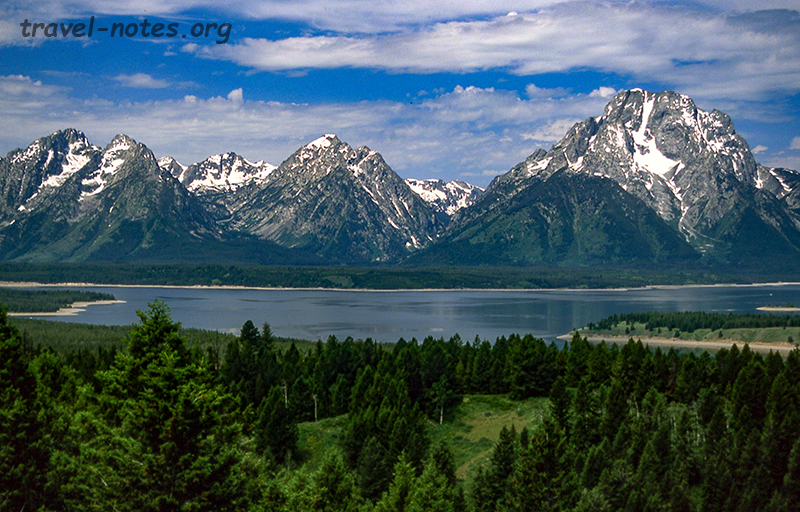 Click here for more photos from Grand Teton National Park.